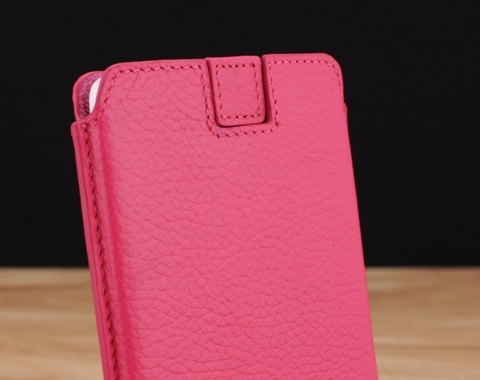 Custom Premium Leather Phone Pouch With Top Slide-In, Curved Bottom, and Pull-Out Strap to Make the Phone More Accessible. 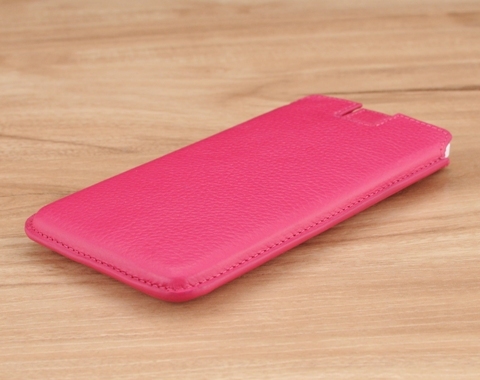 Genuine leather hard shell phone sleeve, customizable for any smartphone. 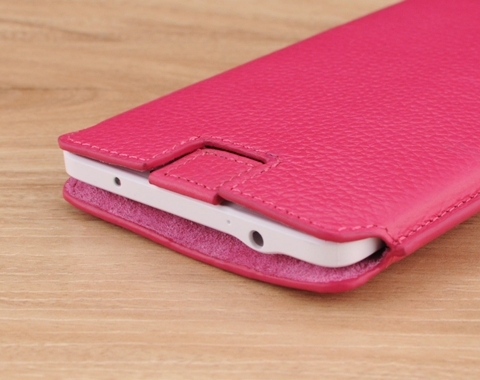 Protect your phone with the most elegant and stylish leather sleeve on the market. Using the finest workmanship, our team of leather artisans beautifully crafts a form fitting sleeve with your choice of genuine leather color and texture to give your smartphone that perfect fit. I love this iphone 7 cover. The quality is everything I expected and more. Thanks for creating such great products. I favor this style of phone cover and have used similar products in the past for earlier phones. 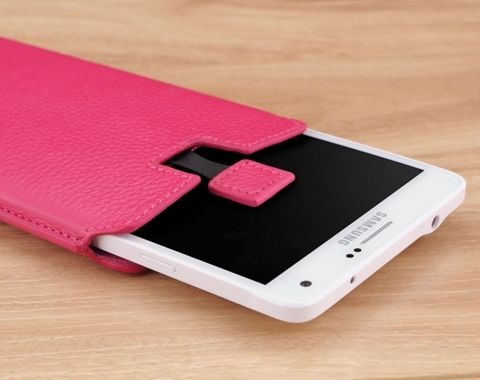 The StoryLeather product is exactly what I was looking for for my new S6 Edge. The quality and workmanship is good, design and fit for the Edge is very good. I have used it for about 5 weeks and it is holding up very well including the tab of withdrawal. I have a second S6 Edge for my Thailand mobile and I will be ordering a second Boxxee Curve for it. This case is perfect and exactly what I was looking for. I needed an identical case to match a discontinued one that my boss had been using for years. I found this site and was able to customize a case to be exactly what I needed with even better quality. There are so many customizable options, as well as accessories available to add. Before finding this site it was impossible to find a high quality leather phone case WITH a belt clip. And, the customer service is excellent. The iChat feature and phone calls were both some of the best customer service experiences I've ever had. A rep helped me find exactly what I needed via iChat and I was needing something pretty specific. I asked a ton of questions and they had all the right answers. Great product, great service. I placed a previous order and was not thrilled with the color combo (phone sleeve one color, neck strap another). StoryLeather made it right by graciously replacing the strap. I was so impressed with their customer service that I then ordered the Boxxee Curved (with custom neck strap-braided and non-adjustable). It is fabulous! I am using this with an iPhone 6 PLUS. I asked them to allow just a smidgen more room than usual, because my first sleeve (see above) fit so tightly, that slipping the phone into the sleeve depressed the volume buttons, lowering volume so I could not hear the phone ring. They did as I asked, and I consider the resulting sleeve to be PERFECT. These folks are excellent to deal with and produce a superbly crafted, practical, and great-looking product. I highly recommend this company and this product. Good fitting case with a genuine leather feel that feels snug and professional at the same time. Highly recommended! This is my second Boxee and I am so happy with the product and service I have already ordered a third. Thank you for your quick responces to my questions and your suggestions. Excellent product, fits my I-Phone 6 perfectly. How thrilling to receive my phone pouch. Leather was superb and I was delighted at the quality of manufacturing.. Without a doubt the best phone pouch I've ever used. Presentation parcel was exciting to receive. Beautiful. I would highly recommend Story Leather as a quality company. Website was easy to use and I was kept informed of my order progress. My Boxsee Curved fits snuggly around my new iPhone 6 Plus and fits in my pocket nicely. Looks beautiful with my custom tab and thread colors to match the inside. Great job by Story Leather. Highly recommended. Great product, fits the phone perfectly!! Nice to get a case that is not run of the mill. Good follow up customer service. Will recommend to friends and family.